Technically speaking any animal is scientifically considered to be "inbred" if it has a coefficient of inbreeding (derived from a mathematical formula devised by Sewell Wright in 1922) of 0.04 or greater. So to be absolutely pedantic the vast majority (if not all) of today's Arab horses are "inbred", even those with apparently "open"; pedigrees (those with no repeated ancestors in the first five generations working from the horse backwards) will probably have a coefficient of at least 0.06 which is a statistically significant degree of inbreeding. Fx is the inbreeding coefficient of the horse in question, Fa is the inbreeding coefficient of the common ancestor, n1 is the number of generations from the sire to the common ancestor, and n2 is the number of generations from the dam to the common ancestor Having hopefully established that just about every Arab horse is inbred to a greater or lesser extent in scientific terms, in common parlance inbreeding usually refers to the mating of close relatives, brother to sister, father to daughter, mother to son etc and linebreeding to the mating of more distant relations, half brothers &amp; sisters, grandfather to granddaughter and so on. The object of the exercise being to &quot;fix&quot; the desirable characteristics of one or more exceptional ancestors in the offspring of the proposed mating. The rationale behind this process is that not only will the resulting foal look good it is highly likely that it will (when mature) always pass on these desirable qualities to its own offspring in the fullness of time. Of course even exceptional horses are not perfect, and the possibility exists (however remote it might be) of producing a foal with all of the faults but none of the strengths of its illustrious forebears. When inbreeding or linebreeding great care must be taken in the selection of breeding stock and it is not something that should be undertaken lightly. However with skill, a sound understanding of the bloodlines one is breeding gleaned from painstaking research and a good eye for a horse the benefits can be considerable! It is essential if one is to use this breeding tool that the &quot;normal&quot; rules of good breeding practice are strictly adhered to. Since the idea is to produce an individual that is both prepotent and superior to its parents not one that is guaranteed to have and pass on their faults. Linebreeding is a powerful tool and needs careful use and consideration as well as honestly appraising the results of each mating. Those that are and have been very successful with line breeding such as Ansata, Om El Arab, Dr Nagel, Peter Gross and the Filsingers don't just concentrate on one particular line but on a handful, blending one or two sirelines in with two or three damlines to get the results they want. It is of course possible to linebreed to just a sire for a generation or two and get good (or even exceptional ) results, this isn't the way that the real "artists" of the breed do things. In fact even if you are thinking of linebreeding to an exceptional stallion, you are not only hopefully increasing the influence of this sire but also that of his dam, therefore it makes sense to try to take into account the influence that at least this damline is going to have on your breeding programme in addition to that of your chosen stallion. So what does the pedigree of a linebred horse look like? What effect does a significant amount of line breeding have on how inbred a horse actually is? Lets look at an example and find out. The Chief & Oran were full brothers. Riyala, Risala and Rim were all daughters of the mare Ridaa. Risala was the dam of both Rythma and Rasim. Rasim (a grandson of Ridaa) sired Razna and Raseem out of the Ridaa daughters Riyala and Rim respectively. All the great grandsires are from the Ridaa female line or family. Both the sire and dam of Sharfina were by Shareer. Exceptional was thus linebred to Rasim and to Rasim’s granddam Ridaa. His coefficient of inbreeding (over 8 generations) is 0.2321, which is substantially higher than the figure for a horse with an open pedigree. The actual number of crosses to his most significant ancestors is shown below. The percentages shown in the AGR column in the table, are the percentages of genes that statistically the horse should share with the named ancestor. From this column we can deduce that Exceptional had (statistically speaking) essentially the same genes as his sire The Chief and grandsire Oran both being by Riffal out of Astrella. He was also effectively (in terms of the percentage of shared genes) a grandson of Rasim, Risala, Mesaoud, Astraled, and Narghileh having at least 25% of his genes in common with these horses. Exceptional was therefore a horse rich in the blood of these early Crabbet horses. This is effectively what line breeding does, it maintains the influence of significant ancestors at a level somewhere between that of a parent and a grandparent over however many generations it is practised. However, one of the effects of linebreeding, is that over a period of time and a number of generations the genetic base of ones breeding stock becomes significantly reduced. This is particularly true if one started out with foundation stock that that were already related to one another, even if those initial horses were only fairly distantly related. This is especially true if one is breeding within a closed group of predefined horses such as the Straight Egyptians where the number of “usable” bloodlines is artificially constrained by the definition of the group, even before the breeder chooses to restrict themselves only to certain bloodlines. The long-term viability of such groupings is a cause for concern in itself but one that falls outside of the scope of this article. Linebreeding is a tool which can be very effective if used correctly and in moderation, it can be thought of as an “effort multiplier” rather like the power steering in a car that makes life so much easier when you want to park! Since it is purely a tool it doesn’t make judgements it just does its job. Either for good or bad depending on the soundness of the breeding decisions of the person using it. Whilst the tool can make the good choices better it will also make bad choices much worse with equal ease and efficiency, something that should always be at the forefront of the breeders mind should he or she decide to use it. Like DIY power tools which can make tasks easier when used correctly but can equally (and rapidly) create a real disaster in the hands of an unskilled novice, linebreeding should not be used or undertaken lightly nor of course are horses pieces of wood which can easily be discarded should one happen to cut a bit too much off by mistake. To continue the analogy for just a moment longer carpenters do not try to do their job with just the one screwdriver nor should linebreeding be the only tool in the breeders “toolkit”. I believe that the benefits of linebreeding are most significant in the first generation or two thereafter the possible gains diminish rapidly away to nothing whilst the risks of “getting it wrong” remain at best constant. It is also essential I believe that if one is linebreeding to a particular horse in order to “fix” his or her look, then this horse is the only one that should be doubled up in the first generation of linebreeding, thereafter other lines can be re-introduced as the breeder sees fit. Studying the pedigree’s of horses bred by those who have practised the art of linebreeding for many years, shows that the “recognisable look” which has resulted is almost invariably the product of a generation or two of linebreeding followed by an outcross followed by another generation or two of what I shall call “adjusted” linebreeding. I use the term “adjusted” because the breeder needs to allow for the new blood that has been added and also for the changes in the breeding stock that will have occurred over the previous generations. This post outcross linebreeding will probably not be to exactly the same horse(s) as before the outcross and the characteristics that the breeder is now trying to “fix” will also have changed, even if only slightly from before. A breeding programme evolves over time, as the horses used within that programme change with each generation, therefore the breeding decisions made must also change subtly to reflect and take account of what has gone on before. In most cases the “outcrosses” used in such breeding programmes are far from being totally unrelated to the breeders own stock and the “new” bloodlines are few in number but perhaps sufficient to reinvigorate the breeding programme and to take it in a new and slightly different direction. One further point to make is that whilst the science of genetics hasn’t so far established quite how certain physical characteristics are linked to a horses colour, there is strong anecdotal evidence to suggest that such links do exist. I would strongly recommend therefore that when linebreeding to a particular horse, the sires used to achieve this, should wherever possible be the same colour as the horse that one is linebreeding to. The most important tool in any breeders “toolkit” is a good eye for a horse, in fact I believe that without that eye, one probably shouldn’t be breeding horses at all! Secondly comes a clear vision of what it is you are trying to achieve, this needs to be something rather more concrete than “a very good horse”. 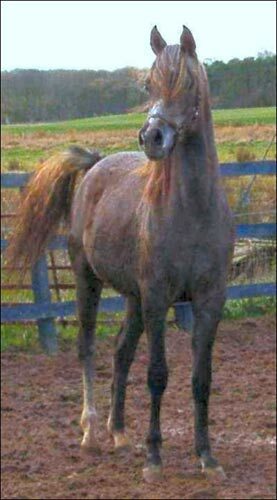 The breeder needs to have a clear mental picture of exactly what the horse that they are trying to produce looks like. The next most important tool is a good working knowledge of pedigree’s and the horses therein. Knowledge is Power! As I hope to be able to show later. After these three come linebreeding and out crossing which I believe should be given equal importance along with the knowledge of when to stop practicing them. Just because a degree of linebreeding or out crossing may prove to be a good thing , it most definitely does not follow that more of the same will be even better. Equally one should not be breeding just to perpetuate or add names in a pedigree, ultimately what counts is the quality of the horses bred and this is rather more important than the methods which were used to achieve the end result. However it is not necessary to breed together close relatives in order to gain some benefit from careful line breeding as I hope to show in the following examples from my own very modest efforts in breeding. Below is the pedigree of the mare W Princess Bahiya, a daughter of the well-known Morafic son The Egyptian Prince. Her pedigree is perhaps typical of the straight Egyptian breeding programmes of twenty years or so ago. She is the result of two generations of linebreeding to Morafic which followed a single generation of linebreeding to Morafic’s sire Nazeer and to the mare Malaka who was the dam of Salomy as well as of Samia whose name appears in the bottom right hand corner of the pedigree. 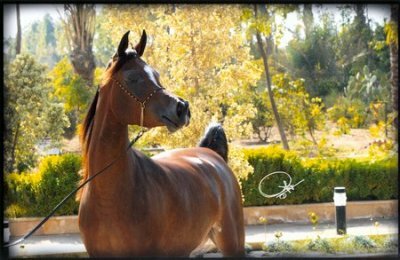 In the second generation of US breeding the Nazeer grandson Samim was bred to the Nazeer granddaughter Il Durra to produce the mare Yasamin. Thus “doubling up” on the Nazeer blood, both horses also traced in tail female line to Malaka, with Samim being a grandson and Il Durra being a great granddaughter of the same mare. This female line was thus also “doubled up”. Yasamin was then bred to the Morafic grandson Sar Ibn Moniet to produce the mare Hi-Fashion Bahiya. This mating changed the emphasis of the linebreeding since the Morafic blood had now been doubled up as well and additional lines to Nazeer were also added since Sar Ibn Moniet’s dam Sirella was linebred to another Nazeer son namely Rashad Ibn Nazeer. Hi-Fashion Bahiya was also linebred to Moniet El Nefous since she was the dam of Ibn Moniet El Nefous, Bint Moniet El Nefous as well as Mabrouka who was the dam of Morafic. The final breeding of Hi-Fashion Bahiya to TheEgyptianPrince effectively maintained the status quo as this was a mating to a Morafic son whose dam Bint Mona was by Nazeer out of Mouna who was a full sister of Mabrouka who was in turn (as previously mentioned ) the dam of Morafic. W Princess Bahiya is therefore the result of some pretty intense linebreeding over these three generations! In fact she has 10 lines to Nazeer, 6 to Moniet El Nefous, 3 lines to Morafic, 4 to Sid Abouhom (who sired Mabrouka and Mouna), and two lines each to Malaka and Rashad Ibn Nazeer. 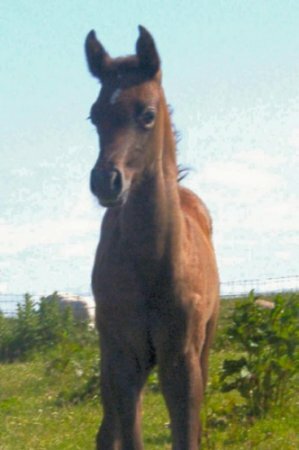 In fact Hi-Fashion Bahiya’s owners, initially Bentwood Farm and later Mr Tom Salome (probably best known for being the breeder of Thee Desperado), must have been happy with the results of this linebreeding to Morafic, as all her foals (mainly by Shaikh Al Badi and later by Thee Desperado) were bred in this fashion. So the question for a breeder is “Where do you go from here?”. First of all we need some details of the mares strengths and weaknesses as it is extremely unwise to breed from a pedigree alone, even if it may speak volumes to the knowledgeable! Firstly as one might expect she is an extremely pretty mare with huge eyes and very expressive nostrils capable of considerable expansion. As one might expect given her breeding, she isn’t a big mare either (standing at around 14 hands 2 inches) though lack of size is hardly a fault! Obviously as a breeder one wishes to maintain the strengths, whilst improving on the weaknesses. Breeding her to a horse with good hind legs and movement should help in these areas, as I also wished to increase the mares height it is worth looking at her pedigree a little more closely for clues which might help. Rashad Ibn Nazeer and Sid Abouhom were both tall “leggy” horses, and in addition Sid Abouhom was sickle hocked (that is he had over angulated hind legs) the exact opposite fault of the mare. Increasing his influence in conjunction with using a sire with good hind legs could well help in correcting this particular fault. Also Moniet El Nefous was a small very refined mare so further linebreeding to her would be unlikely to help increase the height of the foal. It is worth noting that the mare is Koheilan Rodan in strain tracing to the Blunt foundation mare Rodania through the mare Ridaa and that Ridaa was also the dam of Rissla (1917) who was particularly famous for her movement. Reinforcing the strain and tail female line might well help considerably in improving the mare’s movement. Finally as W Princess Bahiya is the result of two generations of linebreeding to Morafic, this is probably the point where some fresh blood and a change of emphasis would be most beneficial. The path that I chose to follow, was to return to the policy of linebreeding to Nazeer, which had occurred three generations previously. In order to be linebreeding to Nazeer himself, rather than to one of his offspring, the chosen sire would have to have sources of this blood which do not appear in the pedigree of the mare. Some Sid Abouhom blood from a source other than Morafic’s dam Mabrouka would I thought also be advantageous. The stallion that I chose to breed W Princess Bahiya to was Classic-Maidan who fulfilled all of my criteria being a horse of good size and substance and exhibiting exceptional movement. In pedigree terms he has seven lines to Nazeer (through the Nazeer sons Kaisoon (twice), Hadban Enzahi, Ghazal, and Alaa El Din and his daughter Bint Bukra none of whom appear in W Princess Bahiya’s pedigree and a final line through Malaka to whom the mare also traces), four lines to Sid Abouhom, two lines to Anter, two lines to Bukra and also a line to Sameh. In fact Anter (who can be considered to be a good source of movement) appears in exactly the same place in both pedigrees. The position of Anter and Malaka in Classic-Maidan’s pedigree to some extent resulted in this mating duplicating the one that produced Il Durra in so far as these particular lines were concerned. Fareeda the filly resulting from this mating, more than fulfilled all my hopes and expectations for the mating! She is extremely typey, She is pretty with huge eyes like her dam, but is a much bigger and more substantial individual and doesn’t have her mothers “over straight” hind legs. Fareeda has the Nazeer “look of eagles” and the icing on the cake is that her movement is simply breathtaking! In terms of linebreeding Fareeda is intensely bred to Nazeer having seventeen crosses to him as well as still having the strong influence of Morafic inherited from her mother. In fact Classic-Maidan’s grandsire Maymoon and Morafic, so far as I am able to judge, seem to have been very similar horses in type and style which may well have assisted in the successful result of this mating. 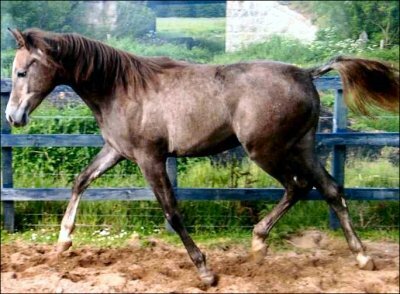 If anything, quite possibly because she is a grey, Fareeda is rather more of a “Morafic” looking horse than her dam. Fareeda’s Pedigree Whilst I personally felt at the time that for W Princess Bahiya the third generation was the time for a change in breeding strategy from linebreeding to Morafic another breeder, more knowledgeable and skilful than I felt differently about his closely related mare Desperado’s Fancy (Thee Desperado X Hi-Fashion Bahiya) who is a bay like Yasamin rather than a chestnut like her dam and half sister. Also linebred to Morafic, this linebreeding was continued for another generation by using the stallion Tallahsman (Imperial Madheen X Bint Atallah). By coincidence Imperial Madheen’s sire Messaoud is a maternal half brother of Maymoon (the grandsire of Classic-Maidan), the mare Maymoonah being the dam of both. Tallahsman also traces to Maymoonah’s full brother Mahomed. The bay filly Fayrouz SQR who resulted from the mating of Tallahsman to Desperado’s Fancy went on to be Reserve Champion Filly at the Egyptian International Show as a three year old. Fayrouz SQR has a total of ten crosses to Morafic, six of them from her dam and four from her sire, no fewer than twenty eight lines to Nazeer and she also has two lines to Ruminaja Ali, one line from each of her sire and dam. Her sire Tallahsman is a grandson of AK Atallah who is best known in the UK as the dam of the former World Champion mare Aliha (Indian Silver X AK Atallah) who was in turn the dam of the double World Champion Atlantica (El Shaklan X Aliha). It is, I think, interesting that Thee Desperado is a grandson of The Egyptian Prince through his dam AK Amiri Asmarr and her maternal granddam Nagliah was by the Sameh son Ibn Hafiza, there are more similarities between the pedigree’s of Fareeda and Fayrouz SQR than is perhaps apparent at the first glance. Linebreeding can thus be used by the breeder as a means of “fixing” a particular “look” or of bringing to the fore attributes and characteristics associated with a particular ancestor (or ancestors). This is especially true when one selects the individual matings based on physical compatibility as well as attempting to match pedigrees so as to enhance the influence of the desired exceptional individual on the appearance of the resulting foal. A detailed study of the pedigrees of ones horses, even if one has no intention of linebreeding, will greatly assist in removing the majority of the “guess work” which often accompanies the selection of the stallion that one chooses to breed to a particular mare. On occasion as indicated earlier one may wish to linebreed to more than one horse, so as to bring a blend of characteristics to the fore. This filly Radeyah is linebred to both Kaisoon (3 crosses) and Sameh (2 crosses) the intention being to combine the extreme dryness of one with the smoothness of the other and produce a typey yet strong-bodied individual with floating athletic paces. Linebreeding is not something to be undertaken lightly, and all the possible implications need to be fully thought out before proceeding. 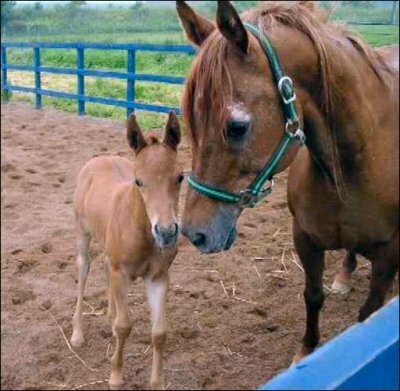 Even exceptional horses have their faults as well as their strengths and wherever possible these faults need to be balanced out by other horses in the proposed foals pedigree, which should ideally complement the one(s) being linebred to. The Arab horse is the epitome of harmony and balance, something that should be borne in mind when making breeding decisions whatever ones breeding strategy might be, the aim should always be for the best foal a mare is capable of producing which is I believe, the aim of every serious breeder. This article is dedicated to Fareeda (2002 – 2005) who is sadly missed by all who knew her.